Space for Cycling is a campaign created by the London Cycling Campaign in response to the anger and frustration at the continued cyclist fatalities on London’s streets. The campaign calls for protected space for cycling on main roads, including segregated tracks and cyclist-specific traffic lights, and reduced risk to cycling on minor roads, such as removing through motor traffic and 20mph speed limits. The campaign’s priorities are set out in six key policy themes. Space for Cycling has already been successful in getting Mayor Boris Johnson to announce major changes. This includes removing the Elephant and Castle north roundabout, building a segregated Superhighway to Camden, and putting in Quietways. Southwark Cyclists is campaigning for for bigger changes. If there is a change that you’d like to see in your local area, we can help. This could be anything from a new cycle route to more bike parking. If you want to get involved but don’t know where to start, join our discussion group. 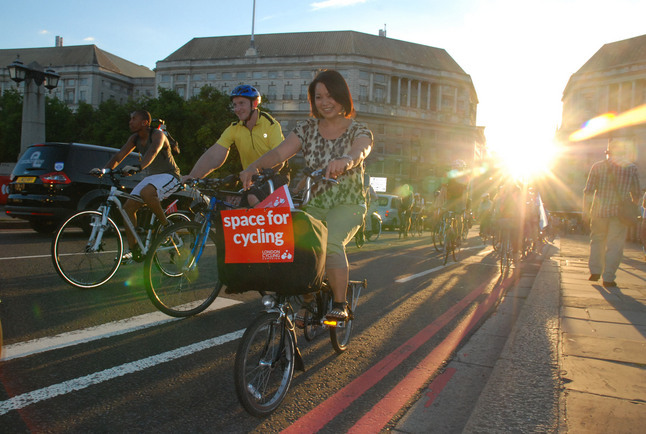 Space for Cycling became a massive campaign in the lead-up to the 2014 local elections. Working with tens of thousands of supporters, and the network of local LCC groups, LCC identified a single Space for Cycling demand in every neighbourhood, which is based on one of six policy themes. In December 2013 it ran a survey to identify local issues around cycling provision; at Southwark Cyclists we then analysed the findings and came up with draft proposals for local demands. These were finalised and agreed at a public meeting at Peckham Liberal Club in February 2014. We have Space for Cycling asks in every one of the local electoral wards. This is the area represented by a local Councillor. Working at ward level means the campaign is truly local, whilst also benefiting the entire city. These aren’t the only things that Southwark Cyclists are asking for, but in 2018 we’ll be evaluating progress on the ward asks to test the council’s commitment to cycling. If you want to get involved with the campaign then contact us or join our <a href=”https://groups.yahoo.com/neo/groups/SOUTHWARKCYCLISTS/info” target=”_blank”>Yahoo discussion group</a>.